Bas Wie was an orphan who had survived the Japanese occupation of Timor during World War II. He worked in the kitchens at Kupang airport for food. He remembered the Australians’ liberation of Timor during the war and their kindness as they offered him sweets. When Bas heard that a Dutch plane on the runway was going to Australia, he determined to stowaway. The plane door was locked, so he folded himself into the only available space – the wheel compartment. When the plane landed in Darwin on 7 August 1946, Bas Wie was found unconscious in the undercarriage, lucky to have survived. His shoulder blade was cut by the spinning wheels on take-off; he was burnt by the exhaust and buffeted with freezing blasts from the propellers during the journey. Bas was treated in the Royal Darwin Hospital for his serious burns. There was a media frenzy surrounding the arrival of the “Kupang Kid” and deliberations over his future. Under the White Australia Policy, the Indonesian boy was an undesirable visitor, although members of the public immediately offered to adopt or shelter him. 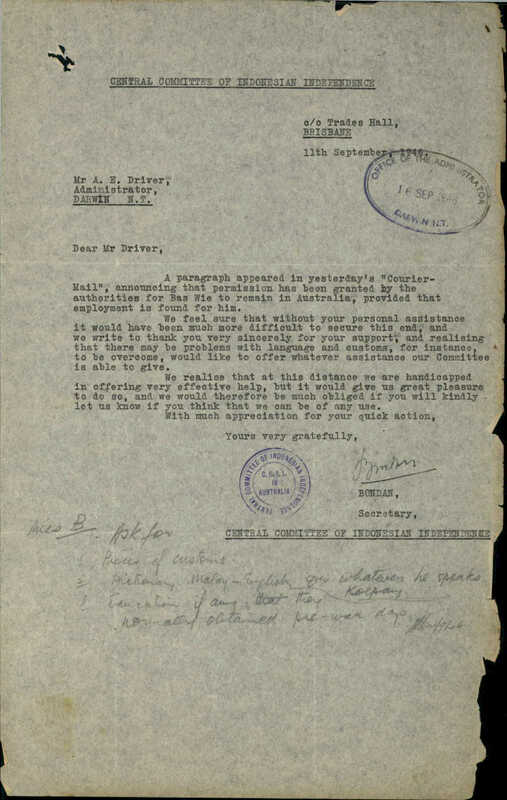 The Administrator of the Northern Territory, Arthur Robert (Mick) Driver, employed Bas on his personal staff at Government House and applied for an exemption for Bas from the Immigration Restriction Act. Frequent extensions of Bas Wie’s certificates of exemption were required and granted. Bas went to a Catholic school, where he thrived socially and academically. In 1951, Mr Driver’s term as Administrator came to an end and he was leaving the Northern Territory. He found Bas Wie a job working at Izods Motors but Bas, aged 16, needed a new guardian. He was legally adopted by a close friend’s family. Bas Wie applied successfully for naturalisation in 1956, 10 years after his arrival, and was naturalised in 1958. Bas Wie married Margaret Brown in 1957; they had five children – three sons and two daughters. He worked for some time in the Northern Territory public service.